James Sullivan has been talking to another of Ireland’s sprinters, 200m specialist Steven Colvert. 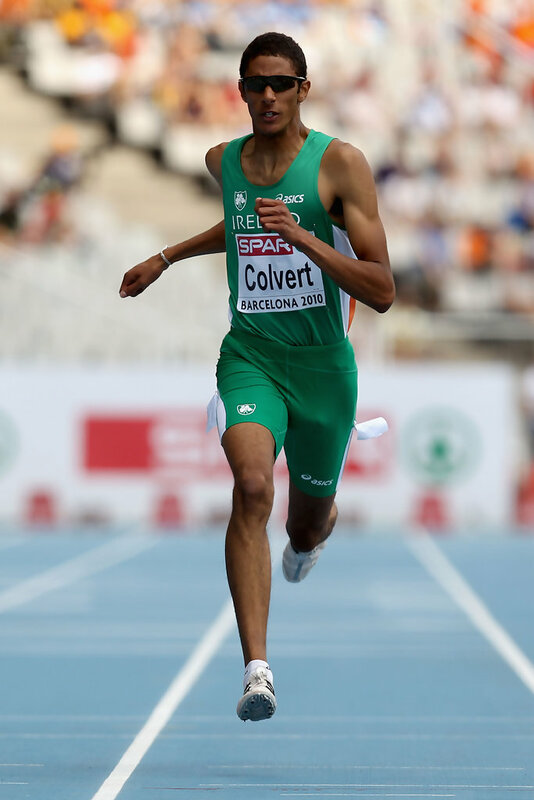 Stephen Colvert is an elite sprinter from Dublin, Ireland who specialises in the 200m. He represented Ireland at the 2010 and 2012 European Championships in Barcelona and Helsinki respectively. He finished 6th at the 2011 European Under-23 Championships in Ostrava. His PB of 20.57 ranks him 3rd on the Irish all-time list. At the 2012 Irish Championships he recorded a time of 20.40, which was inside the 20.55 A-Standard for the London Olympics. However, a +3.0 tailwind resulted in the performance being ineligible for selection purposes. Steven: I got involved back when I first started college in UCD. Steven: To be honest I didn’t follow athletics when I was growing up, so I didn’t have an athletics idol per se. However I was a very big fan of Thierry Henry. That lad could play soccer and he was so cool and calm all the time. Steven: My strongest attribute is possibly my top end speed. I think my starts would certainly have to be the area with the biggest room for improvement. I’m a bit of a slow starter. James: You have participated in a number of European Championships, namely the 2011 European Under-23’s in Ostrava and the 2010 and 2012 European Seniors in Barcelona and Helsinki respectively. How would you describe the experience of representing your country at international level? Which of these events brought you the most satisfaction? Steven: International representation is always a great feeling. Putting on the Irish singlet is always a proud moment. It’s what all athletes strive for, to represent your country and earn the right to walk into that stadium under your nation’s flag. That’s the single greatest honor an athlete can ever have. I’d probably have to say Ostrava in 2011 brought the most satisfaction as it was the first competition where I was truly competitive. Barcelona in 2010 was really more of an introduction to international competition, while Helsinki was a bit of a disappointment as I under-performed and ended up getting disqualified. Steven: I suppose it would have to be my final attempt at qualifying for London back in 2012 at the national championships. It was my last chance to get the A-standard for London and I really needed to perform. I managed to go out in the heats and run a 20.40. Unfortunately the wind was over the legal limit and the time didn’t count towards qualifying for London. However, I was able to take away the fact that I can perform under pressure, so for that reason that is the moment I am most proud of. James: How would you describe the disappointment of missing out on Olympic selection due to a slightly illegal tailwind? Steven: Very quickly elation turned into disappointment. It really didn’t hit home until everyone started receiving their Olympic kit and were heading over to London. That’s when it really set in. James: How would you assess your 2013 season? Steven: 2013 was a disappointment. I underachieved. Mentally I wasn’t in the right place. I think I brought some of the disappointment from 2012 into the 2013 season and became a little disenchanted with the sport. Two groin injuries didn’t help either. James: What are your main targets for 2014? Steven: I plan on running new PBs. All going well, I will be eyeing a medal in Zurich. Steven: Monday and Friday are lifting days, while Tuesday, Wednesday, Thursdays and Saturdays are on the track. Tuesdays and Thursday would be the two key sessions; speed and speed endurance respectively. Steven: High paced, low recovery 200’s and 150’s. In terms of technical work, we do several drills. Steven: This year I have a new strength and conditioning coach, John Cleary. There is a big emphasis on gym. It’s half the battle in terms of making progression and there is a big emphasis on technique. The most prominent of the lifts that I do are the clean and hang clean. James: You are well known as a 200m runner. Do you see yourself in the future moving up to 400m? Steven: I don’t know yet. I’d like to go out and give a few a try and see what it’s like before making any jumps in event. At the moment I don’t have the strength for a 400m, although I would like to see what sort of time I could run off my 200m base speed. Steven: I would like to see an emphasis on getting more Irish athletes into semi finals and finals rather than trying to focus on medals. I think the more athletes you get into finals the more likely a medal will come along. James: That’s great Steven. Thank you for your time and the very best of luck in 2014. Steven: No problem, Thanks a million. It’s been a pleasure.